Despite recent perceptions to the contrary, India’s relationship with Israel continues to be limited. Even before Narendra Modi became Prime Minister of India in May 2014, many predicted a strengthening of India’s partnership with Israel. Some argued that the origins of a new approach could be traced back to Modi’s visit to Israel as Chief Minister of Gujarat in 2006 when he promised he would come back to Tel Aviv as Prime Minister. Subsequently, Modi was labelled during the electoral campaign as “Israel’s best friend in South Asia.” Sushma Swaraj, who served as chairwoman of the Indo-Israel Parliamentary Friendship Group from 2006 to 2009 and who had called Israel as “reliable partner” in 2009, was also named Minister of External Affairs in the new government. The proclaimed shift in India’s Israel policy was then allegedly confirmed by the highly publicized September meeting between Modi and Benjamin Netanyahu which was the first held at the prime ministerial level since Ariel Sharon’s visit to India 2003. Following this symbolical visit, India’s Home Minister Rajnath Singh visited Israel in November 2014 and Sushma Swaraj is scheduled to also visit Tel Aviv in June. In addition, many important defense deals were signed following the Bharatiya Janata Party’s electoral victory. The first major development was the announcement in October 2014 that India would acquire 262 Barak-I missiles for India’s Navy. Then, in a surprise move in October 2014, India reportedly favored the purchase of the Israeli Spike anti-tank guided missiles launchers and missiles over its U.S. competitor, the Javelin. Another example of the deepening defense relations is the first visit this week of an Israeli Defense Minister, Moshe Ya’alon, to India since the two countries normalized their diplomatic relations in 1992. There are reports that India and Israel will finalize major defense deals, including the purchase of two additional Phalcon AWACS and four aerostat radars for $1.5 billion. A final indicator of the possible underlying changes occurring in India’s West Asia policy are the rumors that India could change its voting position in the U.N. from an unconditional Pro-Palestine position to abstention. Are we therefore witnessing a paradigmatic transformation in New Delhi’s Israel policy? The narrative of a major shift in India’s Israel policy over the last nine months needs to be put into a broader historical context. 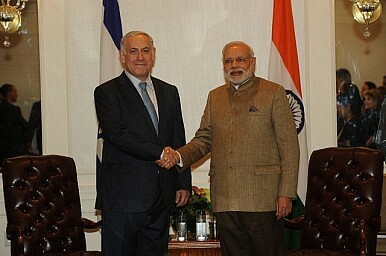 This is not the first time that the emergence of an Indo-Israeli strategic partnership has been prematurely announced. There were similar calls for the establishment of a strategic partnership during the last BJP-led government (1999-2004). In fact, the symmetry with both periods is telling as the first two BJP visitors to Israel were the Home Minister Lal Krishna Advani and the External Affairs Minister Jaswant Singh in 2000. In a complete break with past policies, the BJP government also welcomed Ariel Sharon in Delhi in September 2003. Sharon remains the only serving Israeli Prime Minister to have visited India. The significant and publicized exchanges even led the former National Security Adviser Brajesh Mishra to call for an “alliance” between the two countries (along with the US) in a May 2003 speech. However, despite these public calls for closer engagement, the bilateral relationship has yet to be publicly labelled as a strategic partnership. Most accounts of strengthened Indo-Israeli relations have mainly discussed the increasingly publicized nature of the relationship while not emphasizing any actual substantial changes. For instance, as bilateral trade seems to reach its limits, there has been no significant progress in the Free Trade Agreement negotiations after eight years of discussions. There is also no clear sign that India will radically depart from its pro-Palestine stance. As reported elsewhere, India had already moved away since 2012 from automatically condemning Israel each time a crisis escalated in Gaza. The Modi government’s balancing act during the July 2014 confrontation between the Israeli defense forces and Hamas in Gaza equally demonstrated that India has not decisively tilted towards an unconditional pro-Israel position. In fact, India voted in support of a U.N. Human Rights Council resolution to launch a probe into Israel’s offensive on Gaza at the same time it was negotiating its purchase of the Barak-I missiles. While recent reports have suggested that India’s ambivalent position during the Gaza crisis was due to the former Foreign Secretary Sujatha Singh’s own views on the Israel-Palestine dispute, it is not clear how the Indian delegation at the UNHRC could have voted against Israel without prior governmental approval. Furthermore, Sushma Swaraj asserted in July that India’s policy on the Palestine issue had not been altered. As a result, it can be argued that India will most probably maintain the traditional policy consensus which emerged after the Kargil war. India will preserve a solid buyer-seller relationship with Israel, separate and insulated from its open and parallel political support to Palestinian grievances. The announced paradigmatic change might still happen, especially if Modi decides to visit Israel during his tenure as prime minister. However, the immediate benefits of changing this multi-alignment policy are not clear, while the costs are visible as India tries to engage multiple actors in the Middle-East. Nicolas Blarel is an Assistant Professor of International Relations at Leiden University and the author of The Evolution of India’s Israel Policy Continuity, Change, and Compromise since 1922 (Oxford University Press, 2015). Narendra Modi will become the first Indian prime minister to visit Israel. Indian Elections 2019: Do Narendra Modi and the BJP Deserve a Second Term?Indian Foreign Policy After the Elections: All Eyes on ChinaThe Modi Factor in Indian Foreign PolicySonia Gandhi’s Daughter Enters Indian Politics Ahead of 2019 General ElectionsThe Temple Guardians: Is India’ Ruling BJP Becoming More Conservative?